Here’s a list of my woodworking projects, most recent first. You can click on the image below each project for either a gallery or a full project writeup. We’ve wanted a platform for our cats to be able to look out of the basement ceiling windows since we moved in. 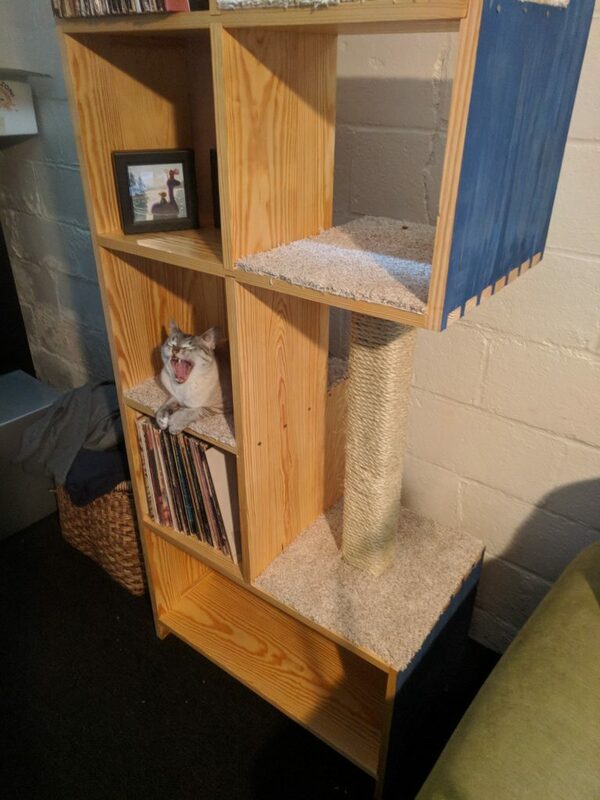 This was my solution, a playful bookshelf that has a route up the back for the cats to climb up. It’s built in southern yellow pine, and the joinery is dovetails and dadoes, with a large frame-and-panel component making up the left side. Up until now, all of my projects have been built on a sheet of 3/4″ plywood with two F-clamps. 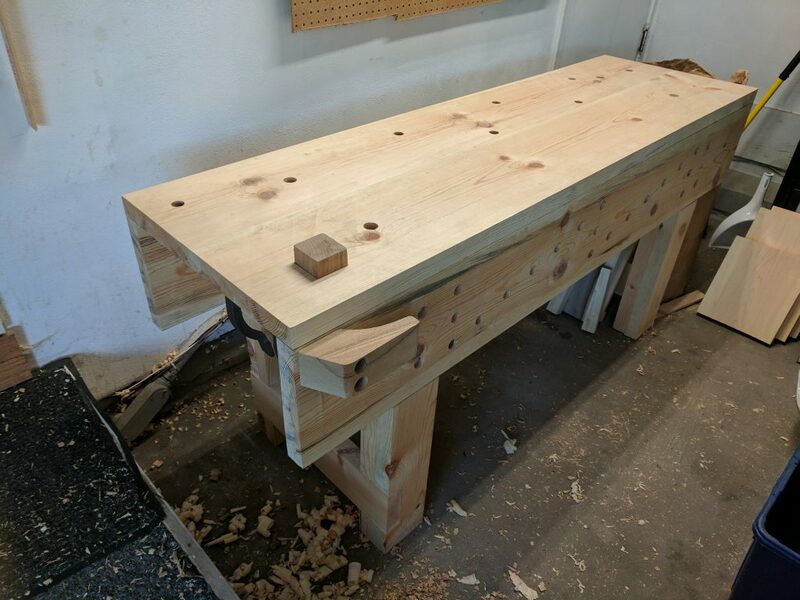 I finally felt I had the tools and experience to be able to build a nice workbench which should last me many years. I found a lumber mill a little ways south of the Twin Cities and bought 64 linear feet of 8/4 pine. They actually milled the 12x12x16′ beam right in front of me. As a result, this bench is actually built from a single tree. Neat! It is as assembly of five pieces—the front and back aprons, the left and right leg assemblies, and the top. They are bolted together with hardware from McMaster-Carr. This is handy since you can break the thing down to sweep up under the bench more easily. I also might replace the top with a more durable wood some day, so being able to replace just that one part is a great feature. The leg currently has no vises, and I use holdfasts for workholding. I may install a leg vise at some point in the future. This was one of the projects that prompted me to get into woodworking. 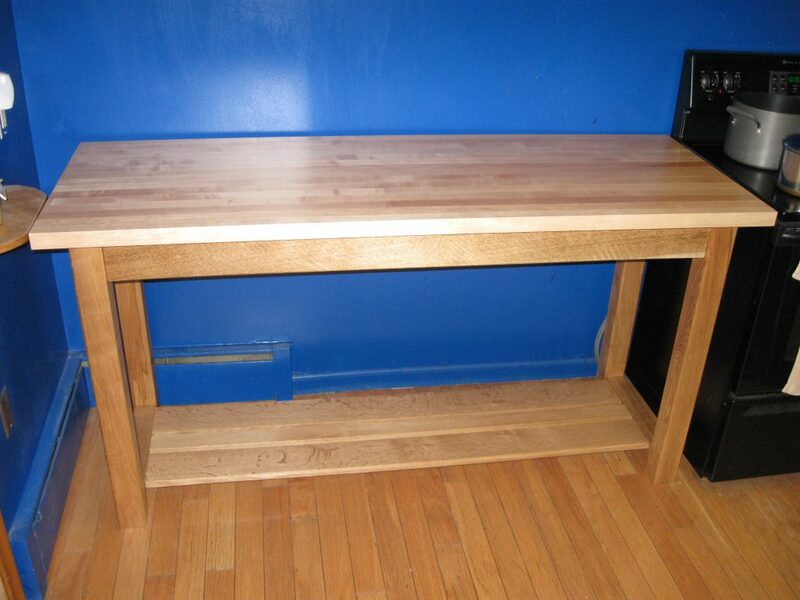 We wanted to increase our counterspace in the kitchen with a nice wooden table, but I couldn’t find a furniture store that sold something like what were looking for. So I decided to build my own. I’m very pleased with how it turned out. It is my best project to date. The frame is quartersawn white oak with ash legs. The top is maple and was purchased through a lumber yard from Michigan Maple. The joints are all drawborn mortise and tenon, and the top is attached with buttons that I made from some offcuts. It is a basic table, following the normal table construction, but it was a challenge due to the size, given my little experience. I built this chest during a pause in the above table project over winter. I had just been storing my tools on the bench, or in drawers or on shelves scattered around my garage, so I needed a better place to store them. Someone on the Something Awful forums recommended Chris Schwarz’s Dutch toolchest, so I dug into that. I made my chest considerably wider than Chris’s plans call for in order to fit my full-size hand saws and my No 8 plane. I was hoping it would still end up being portable, but it really isn’t. I can deadlift the sucker onto my bench or walk with it for a short distance, but it is really too large and heavy to carry. Oh well, it is still a great place to store tools at home. The chest is built from 4/4 pine from the lumber yard, glued up in to panels. The bottom is attached with dovetails. This was my first time cutting dovetails, and they turned out alright. Definitely some gaps in there, but it’s functionally good enough. It was also my first time using cut nails, and I ended up splitting off some end grain where my pilots holes weren’t big enough. A lot of learning experiences in this project. It’s painted with milk paint, which I fell in love with during this project. 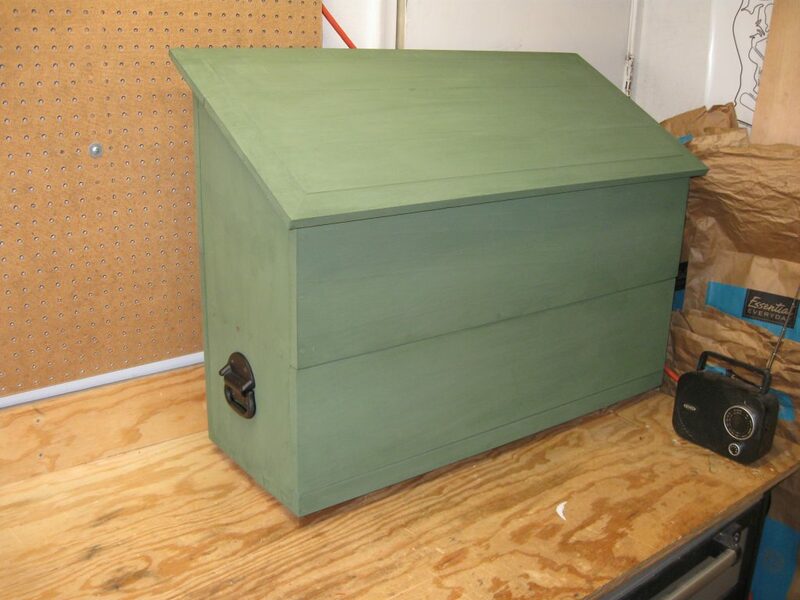 Milk paint dries super fast, so I was able to do three coats in about an hour. It doesn’t stink like cancer or burn your skin. Cleanup is easy, you just wash it down the sink drain. Great stuff. 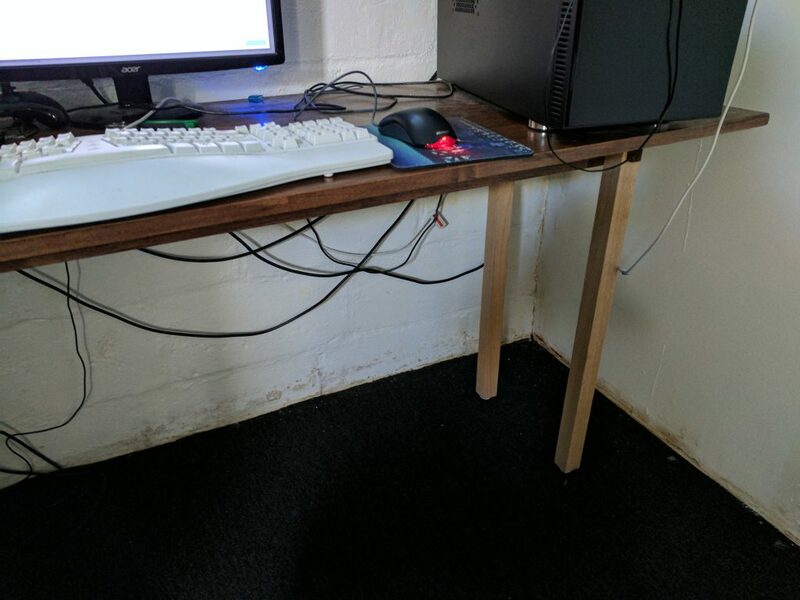 In order to gain some experience before attempting the kitchen countertop table, I built a new computer table for myself. Now that I know more, I know it’s pretty poorly built. I changed the plans halfway through, which meant my short rails ended up way too short, so the frame is very skinny. The through-tenons are also badly done, and one joint has actually already failed. The long rails are actually screwed on through the short rails and into the end grain. Ugh. As my first “real” woodworking project, it did teach me a lot about how to use the tools, though. It was also my first panel glue-up, and I’m actually still pretty happy with the top itself. You can definitely tell this is my first project, but it functions fine and even looks OK if you don’t dig into the details. 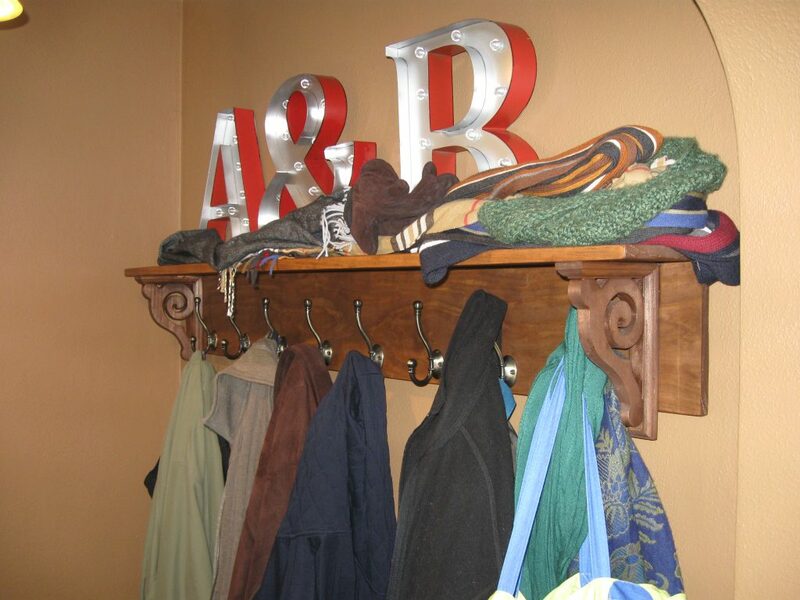 My first ever woodworking project was another piece of furniture I couldn’t buy, a wide, wall-hanging coat rack. The top is edge-glued to the back, and both pieces are screwed into the scrollwork that I bought from the store and stained. It’s hung with a French cleat. It taught me a bit about how to shop for wood and how to use hand saws and handplanes.